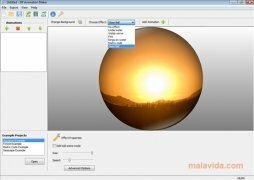 DP Animation Maker offers a pack of simple tools so that any person without knowledge of designing and programming, can create all kinds of creative animations. You will only need the background images and your imagination, because DP Animation Maker offers you the rest of elements. 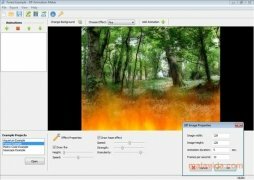 If you want to create a GIF for your website, or create a video with animations for your menu from a DVD, DP Animation Maker is your tool. 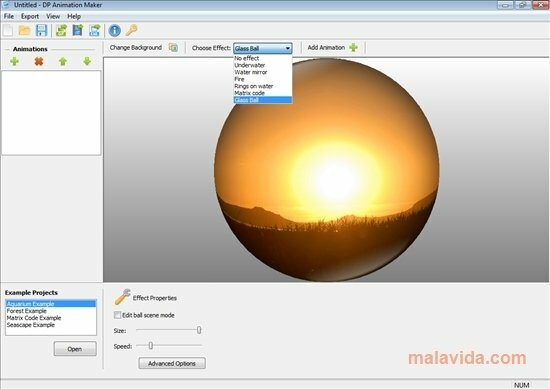 To be able to view the possibilities offered by the application, you can check some of the examples available in DP Animation Maker, and using them as a base, include your own elements and add new effects. If you want to create an animation from scratch, to start off, you will have to choose a background image. From that moment onwards you will be able to apply to that background, some of the effects available, like fire effects, ripples in the water or the Matrix code. And now all you will need to do is add an animation. Flying butterflies with different colors. Ghosts that appear and disappear. Different kinds of fish swimming. Once you have your animation ready, you can export it to GIF, AVI or create an executable file. Download DP Animation Maker and create any animation that you can imagine. The trial version adds a watermark to the animations created.